When her business partner is murdered, his final words convince Shauna that she's in danger too. But where can she turn? Zach Bannister was her husband's best friend and is the person she blames for his death. She's barely spoken to him since. But right now he seems her only hope for protecting her son. Zach is only too happy to assuage his guilt over Jack's death by helping Shauna any way he can. But there are secrets involved dating back to Shauna's childhood that more than one person would prefer to stay hidden. About "The View From Rainshadow Bay (#01 in Lavender Tides Series)"
Customer Reviews For "The View From Rainshadow Bay (#01 in Lavender Tides Series)"
Colleen Coble is the master of Christian romantic suspense, and The View from Rainshadow Bay is no exception. It starts with a murder in the Prologue, and the pace never lets up. It's a detailed plot, with lots of seemingly insignificant events coming together in an unexpected end twist (no spoilers, but I really hope this is fiction!). And that makes it kind of hard to review-pretty much anything I might want to say could be giving away a significant plot point. So I'll keep it simple and say that if you're a fan of Colleen Coble, Christian romantic suspense, or both, then you'll want to read this book. 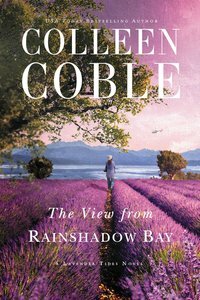 The View from Rainshadow Bay is the first in the new Lavender Tides series from Colleen Coble, so it's a great place to start if you've never read her books before. Recommended. Shauna's husband Jack dies in a climbing accident and when her business partner is murdered, she considers his final words that she's in danger too. Shauna has to make sure that she's around to raise her son Alex. Zack Bannister was her husbands best friend, but she's blamed him for his death for years. Zack carries that guilt too and when events put him and Shauna together he is happy to help, if only to ease the feeling of guilt. Alex loves Zack and Shauna finds she can't refuse to let Zack back into their lives. When secrets from years ago start to surface there are people who would prefer they stay unknown. With hearts softening and truths being uncovered The View from Rainshadow Bay is a story that will capture you and keep you turning pages. Enjoy this first story in A Lavender Tides Novel. When Bailey Fleming wed Kyle Bearcroft, she had no idea he was already married. He tries to mollify Bailey with the ownership of a cabin of his, and when she is forced to flee a murderer, she takes up Kyle's offer. But, unknown to her, the cabin is linked to a human trafficking ring, and an FBI agent is watching. Order now to secure your copy when our stock arrives. Other edition is available. 9780718085803 0 Available. Expected to ship in 6 to 7 weeks from Australia.